On the other hand, children have a significant weight gain following transplantation, and this happens especially during the first year of transplantation when recipients are on higher doses of steroids. , Obesity may have a deleterious effect on graft survival, although this has not been confirmed in all studies. ,,, Despite the importance of growth and, especially, body mass index (BMI) in children, there are limited reports. This study was conducted as a cross-sectional evaluation of growth and BMI following kidney transplantation in children. This study was designed as a cross-sectional evaluation of weight, height and BMI and standard deviation score (SDS) of height and weight. All children or adults who have been transplanted in our center are referred to their primary physician for routine laboratory evaluation and prescription of their transplant medication at 3-month intervals. Our colleagues were requested to measure and record weight and height during a specific 3-month period (1-4-2008 to 30-6-2008). All children who were transplanted at our center from the beginning of transplant activity and were ≤19 years at the time of transplantation with a functioning graft at the time of evaluation were included in this study. For children who were older than 20 years at the time of evaluation, data at the age of 20 years were considered for calculations. Height and weight data at the time of transplantation were obtained from their medical files and also weight and height at their last visit were measured and recorded by their responsible physician during the 3-month period. Children with primary non-functioning grafts and those who expired and those with irregular follow-up or incomplete data were excluded from the study. BMI was calculated using the following equation: BMI = weight (kg) / (height (m 2 ). The Center for Disease Control (CDC) growth charts and The National Health and Nutrition Examination Survey (NHANES) analytic and reporting guidelines 2006 were used for determination of SDS of height and weight. SPSS 15.1 software and paired t-test were used for comparing the means of the pre- and post-transplant weight, height, BMI, SDS of height and weight. P value <0.05 was considered significant. Seventy-one children, 43 (58.9%) boys and 28 (41.1%) girls, were involved in this study. The pre- and post-transplantation values for height, weight, BMI and SDS are summarized in [Table 1]. Their primary renal diseases were as follows: reflux, obstruction and dysplasia 29 (41%), hereditary 25 (35%), glomerular disease 14 (20%) and unknown 3 (4%). They had been followed from 7-175 months (mean, 51.6 ± 30.75 months). The source of donors were as follows: living related 27 (38%), with 15 being mothers, deceased 35 (49%) and living unrelated 9 (13%). Table 1: Important pre- and post-transplant variables in 71 children. Induction immunosuppression consisted of methyl-prednisolone pulse therapy 30 mg/kg (maximum 1000 mg) on days 1 to 3, followed by cyclosporine, oral prednisolone and mycophenolate mofetil (MMF). Fourteen patients who had been transplanted during earlier period were on azathioprine instead of MM. Mean cyclosporine dose at the time of evaluation was 3.52 ± 1.2 mg/kg (range, 0.8-6.4 mg/kg), with an acceptable blood level. The lowest dose belonged to an overweight girl with Bardet- Biedl syndrome. One patient with initial hemolytic uremic syndrome was on double therapy with prednisolone and MMF and another patient and another patient who had received the kidney from his brother had discontinued all of his medication in the 2 nd year of transplantation without any significant consequence. Mean prednisolone dose was 0.09 ± 0.07 mg/kg (range, 0.02-0.33 mg/kg). Serum creatinine ranged from 0.5 to 3 mg%, with a mean of 1.15 ± 0.46 mg/dL. 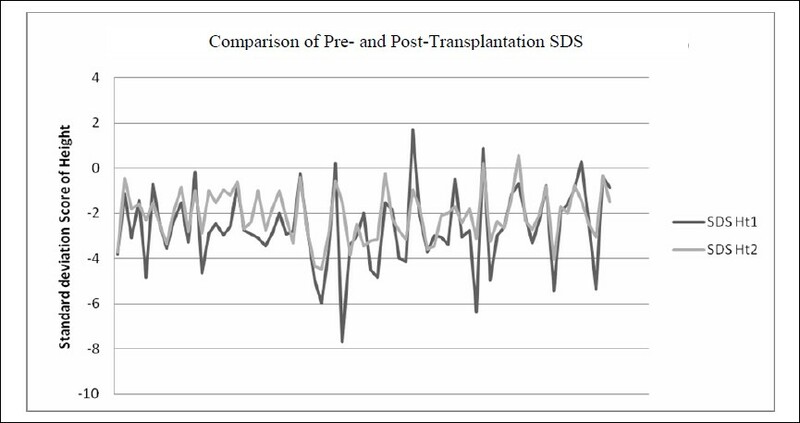 SDS of the values of heights at the time of transplantation are compared with the post-transplantation values [Figure 1], which was statistically significant (P= 0.0003). 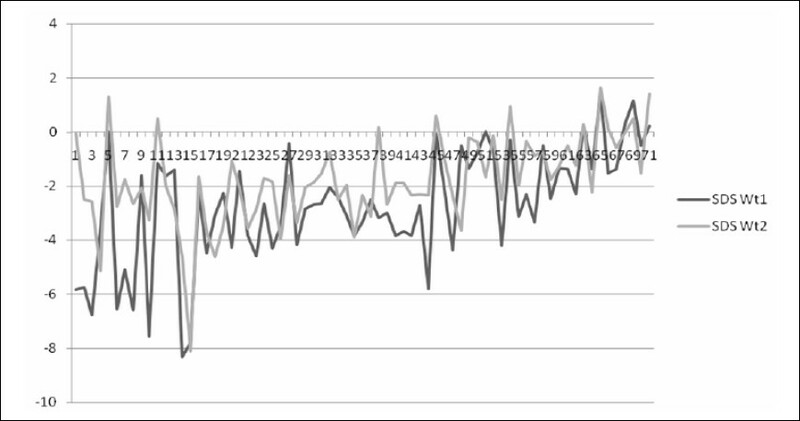 These values [Figure 2] were not significant for weight (P> 0.05). As seen in [Figure 2], catch-up growth occurred only in a few patients at the time of evaluation in the post-transplantation period. Figure 1: SDS for height at pre- and post-transplantation in children. Figure 2: Pre- and post-transplantation SDS of weight. Seventy-one children were evaluated at a mean period of five years after renal transplantation. The SDS of their mean height, weight and also their BMI at the time of transplantation were compared with their post-transplantation values. At the time of transplantation, the majority were below the 3 rd percentile of height and weight, as has been observed in other studies. ,,,, In their post-transplantation evaluation, SDS for height had a significant improvement, as has been seen in other studies. ,, The improved growth that was observed after transplantation was mainly due to a significant height gain of children who were transplanted below 11 years of age. SDS of post-transplantation weight was not significantly different from the pre-transplant values. Lack of significant weight gain was mainly due to a longer period elapsed from transplantation, since post-transplantation weight gain occurs mainly during the first year of transplantation when they are taking the highest dose of steroids. At the time of evaluation, these children were on a very low dose of steroids on alternate days. They may have had a stationary weight or minimal weight gain for a long time after the first year of transplantation. We took the age of 20 years for ease of calculations as the reference values in the pediatric literature includes up to 20 years. Poor nutrition may be a reason for this finding in our patients in comparison with other studies. As has been noticed by Rogers et al  and el-Agroudy,  post-transplantation BMI is influenced by pre-transplant BMI, and because our patients had a low BMI at the time of transplantation, this may have affected the post-transplant weight gain. In our study a vast majority of children had normally functioning grafts and therefore, renal dysfunction cannot be the reason for the lack of significant weight gain in the post-transplantation period. Kidney transplantation had a dramatic effect on height gain in children, but weight gain was less satisfactory. This study had the limitation that it was cross-sectional and the post-transplantation evaluation was performed only once and at different time intervals from transplantation. 1. Seikaly MG, Salhab N, Gipson D, Yiu V, Stablein D. Stature in children with chronic kidney disease: Analysis of NAPRTCS database. Pediatr Nephrol 2006;21:793-9. 2. Gorman G, Fivush B, Frankenfield D, et al. Short stature and growth hormone use in pediatric hemodialysis patients. Pediatr Nephrol 2005;20:1794-800. 3. Gorman G, Frankenfield D, Fivush B, Neu A. Linear growth in pediatric hemodialysis patients. Pediatr Nephrol 2008;23:123-7. 4. Betts PR, Magrath G. Growth pattern and dietary intake of children with chronic renal insufficiency. Br Med J 1974;2(5912):189-93. 5. Fine RN, Kohaut EC, Brown D, Perlman AJ. Growth after recombinant human growth hormone treatment in children with chronic renal failure: report of a multicenter randomized double-blind placebo-controlled study. Genentech Cooperative Study Group. J Pediatr 1994;124: 374-82. 6. Fine RN, Ho M, Tejani A; North American Pediatric Renal Trasplant Cooperative Study (NAPRTCS). The contribution of renal transplantation to final adult height: a report of the North American Pediatric Renal Transplant Cooperative Study (NAPRTCS). Pediatr Nephrol 2001;16:951-6. 7. Ingelfinger JR, Grupe WE, Harmon WE, Fernbach SK, Levey RH. Growth acceleration following renal transplantation in children less than 7 years of age. Pediatrics 1981;68(2):255-9. 8. Vester U, Schaefer A, Kranz B, et al. Development of growth and body mass index after pediatric renal transplantation. Pediatr Transplant 2005;9:445-9. 10. Ingulli E, Tejani A. Steroid withdrawal after renal transplantation. In: Tejani AH, Fine RN, eds. Pediatric renal transplantation. New York: Wiley-Liss, 1994:221-38. 13. el-Agroudy AE, Wafa EW, Gheith OE, Shehab el-Dein AB, Ghoneim MA. Weight gain after renal transplantation is a risk factor for patient and graft outcome. Transplantation 2004;77: 1381-5. 14. Hanevold CD, Ho PL, Talley L, Mitsnefes MM. Obesity and renal transplant outcome: a report of the North American Pediatric Renal Transplant Cooperative Study. Pediatrics. 2005; 115:352-6. 15. Elster EA, Leeser DB, Morrissette C, et al. Obesity following kidney transplantation and steroid avoidance immunosuppression. Clin Transplant 2008;22:354-9. 16. Marcén R, Fernández A, Pascual J, et al. High body mass index and posttransplant weight gain are not risk factors for kidney graft and patient outcome. Transplant Proc 2007;39: 2205-7.